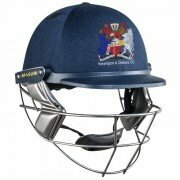 Masuri Cricket Helmets - BRAND NEW FOR 2017 at All Rounder Cricket. Currently used by most of the England Test Cricketers and a time honoured choice of professional and club cricketers for over two decades, the Masuri Cricket Helmet is back and improved to be the safest protective equipment around. Masuri Personalised Cricket Helmets - "Show Your Colours" Your Cricket Club Badge on your Helmet. You will be starting to think to yourself “What equipment am I going to need for this season?” and without question Masuri's new choice of Cricket Helmet for their 2017 range should be right at the very forefront of your immediate thinking. Let me tell you a little bit more about Masuri for those who are unfamiliar with the brand. Masuri started life out of Cape Town, South Africa in 1988. They were pioneers of the nowadays widely used ‘Stainless Steele Grill’, of course back in those days the units were a huge success. The first 3 international players who used their helmets were Dean Jones, Geoff Marsh and David Boon who were 3 stalwarts of the Australian Cricket Team going on to win the Ashes series with England in 1989. 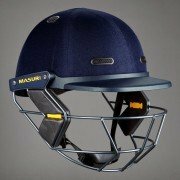 Wanting to provide more and more for the top cricketer, Masuri set out to create a lightweight and adjustable helmet, the first of its kind might I add. They were soon supplying the likes of top cricketers like Brian Lara, Michael Atherton, Graham Gooch and Robin Smith. 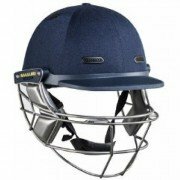 Masuri were the first to produce a Helmet for the Wicket Keeper and the compact three layer shell to name but a couple. 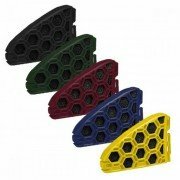 Now based in the UK and growing at a fast pace due to being at the forefront of technology offering such fantastic products, the reason why so many top players use their items is mainly down to the slim line design and a freedom offered to give great movement you just will not find with other manufacturers around the world. The ICC demanded an improvement to player safety and Masuri delivered once again with the brand new Vision Series for 2016. With the latest technology the ball will deflect away from the player’s face time after time, this falls in line with all safety standards but no only that it also sets new standards in Cricket Helmet safety and performance. The X-Line series is the forerunner of the entire range including the patented AP-Tech (Active Peak Technology) and never seen before Eye-Line Grille. The X-Line offers the best vision while at the crease but still gives the player that extra confidence of having superb protection to the face and neck area at all times. The beauty of having the grille around the eye line is it allows the ball to be forced upwards to go on line with the solid part of the peak to shield it from the players face to offer that full protection and confidence needed when facing 90MPH+ bowling. The AP-Tech offers something which is available nowhere else currently on the market, the ability to absorb the full force of the cricket ball ultimately protecting the batsman at all times. The HRS (Halo Reinforcement System) by Masuri offers even greater protection with an extra strong rim which is included within every helmet within the Vision Range. Using the latest technology in reinforced plastics Masuri can guarantee protection even at speeds approaching 90MPH. One of the best features included within the X-Line is the ability to maintain coolness for the user no matter what the circumstances are with the fantastic use of an industry leading 3-layer protection including air slots throughout the cavity. The Vision Series Test will allow you to perform at your optimum level game after game with its superior Air Flow Ventilation. This unit was made to give the best level of protection with any impact from the cricket ball but also to give the highest level of comfort known to any cricketer around the world throughout the season and beyond. - Strategically Placed Vents within the Inner and Outer Shells to improve Air-Flow throughout the product. - Minimising any movement between both the peak and titanium grille to give excellent performance throughout the season. 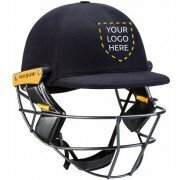 - Grade 5 Titanium or High Grade Stainless Steel, using advanced techniques to provide the ultimate protection for every cricketer. The vision series club is a wise and ultra affordable choice of helmet for all ages of cricketer around the world. No matter whether you are a seasoned veteran in club cricket or just making your first strides in the game you will not be left “short changed” with the Club Range. Having time to reflect on all of the choices above of course the ultimate head protection choice is of course the Masuri Vision Series X-Line Cricket Helmet. With its use of many world leading technologies and patented features it would be a wise choice to make moving into the 2016 season. However, with great protection, comfort and leading features as always carries a greater emphasis on price and it depends on your budget and to what standard of cricket you are playing which may end up making the choice of which helmet to choose for you. If you are going to be facing bowling of 80-90MPH regularly then I would highly recommend the X-Line to give you the ultimate in comfort and performance. However, if the bowling is slightly slower then you should probably look at the Vision Series Test and Vision Series Elite models as they would also deliver a fantastic unit. 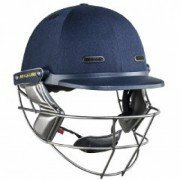 If you are looking for alternatives to Masuri Cricket Helmets then we are currently stocking 2 adult helmets by the legendary Gunn and Moore along with 6 adult helmets and 1 junior product by Shrey and you can take a look at these ranges by clicking on the below links.